Here is my vintage wood cookstove. 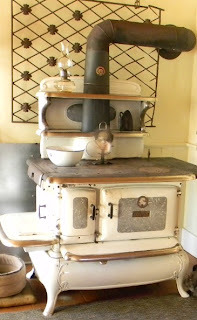 On a snowy day, as it is the day I write this post, I work from home and I get the woodstove going. My woodstove is a cookstove. It is an amazing hunk of cast iron that heats my kitchen and family room to upwards of 79 degrees when really cranked up. When the woodstove is going to be roaring all day, I'll cook a food that takes a long time. This time, I am making a beef stock, then I'll make a beef stew using the stock. Using a variety of beef bones and a bone-in pot roast ($14.00 for all) I place in roasting pan and sprinkle with salt. Into the woodstove oven it goes to roast for about 30-40 minutes to get the juices flowing and nice browning. The key to a good stock is to roast the bones before putting them into a pot of water. You can make stock with pork or use left over roast turkey or chicken bones for a great stock (no need to re-roast turkey or chicken already roasted). For more tips to make stock click here. Remove the meat and bones from the roasing pan and deglaze it using wine. Cut beef into bite-sise pieces and place into large pot. Add peeled and chopped carrots, a few celery stalks cut in half, and 2-4 bay leaves. Cover with water until coverd by couple of inches of water. Then it sits on the stove simmering for hours. Once the meat is tender I remove some of the stock to freeze and save for future use. With the remaining stock and tender beef I'll make a curry stew using a favorite recipe from Epicurious. We love it served over sticky white rice and fresh warm bread.